Ho, ho, ho! Christmas is coming, whether you like it or not! 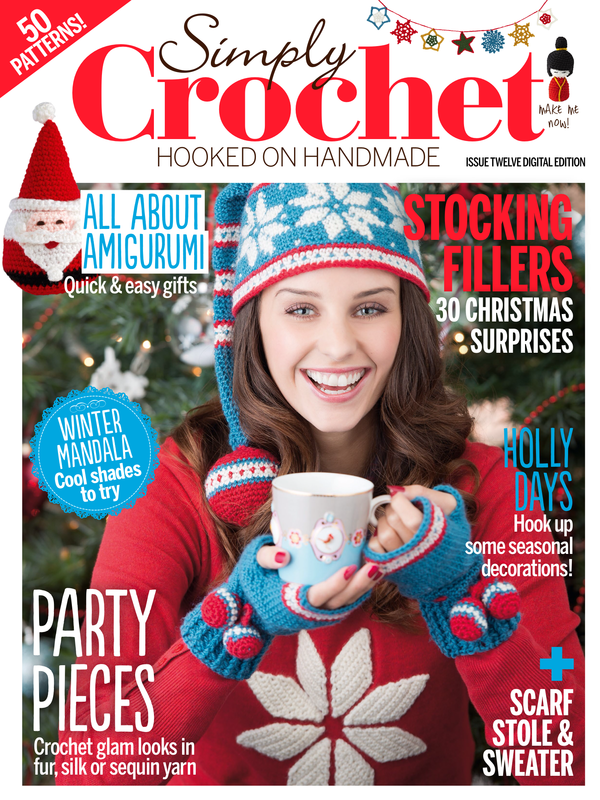 I’m still in denial, even though it was a couple of months ago that we were ‘doing’ Christmas on Simply Crochet. I think that’s part of the problem. I am lulled into a false sense of security because we are forced to think about it early, but this makes me feel as though I am doing something about it, when actually, I am not. 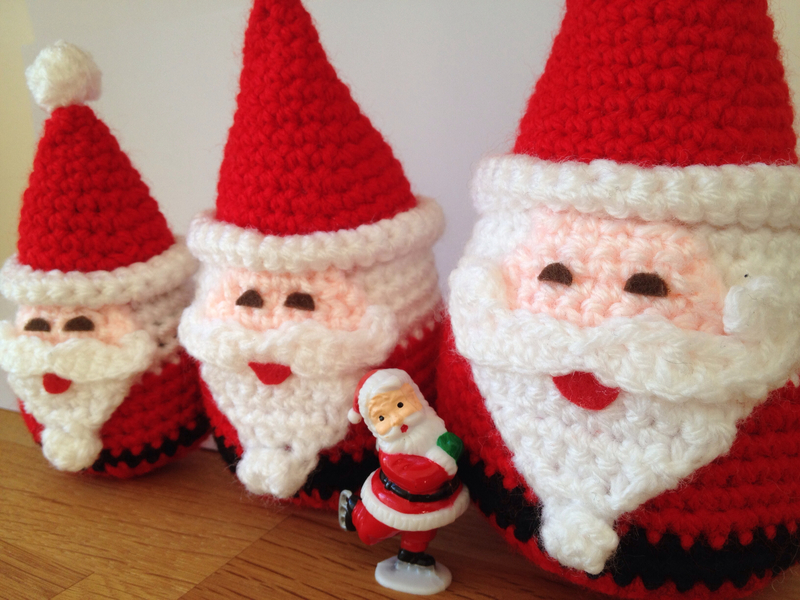 I present to you my amigurumi Santa, from Issue 12 of Simply Crochet. He does get a cheeky look-in on the cover, but you will find him on p.85. When I made him I had the idea of doing three of them in different sizes like Russian dolls, but there wasn’t the time or the space really for the pattern. Now I have managed to accomplish the task here they are, Little, Large, and er, Middle Sized. The full pattern for the Large version is in the magazine, and there are guidelines below for making the other two, although you may need to refer to the original pattern for some of the details. Yes, this is deliberate, because a) I will be in trouble if I reveal too much of the pattern from the mag ;-), and b) I would love you to be acquainted personally with the awesome mag that is Simply Crochet. The diagram and table below (click on the image for a full-sized version) show the general shaping instructions you will need, and also how many rounds to work in each colour. You start at the top of the Hat and work down. 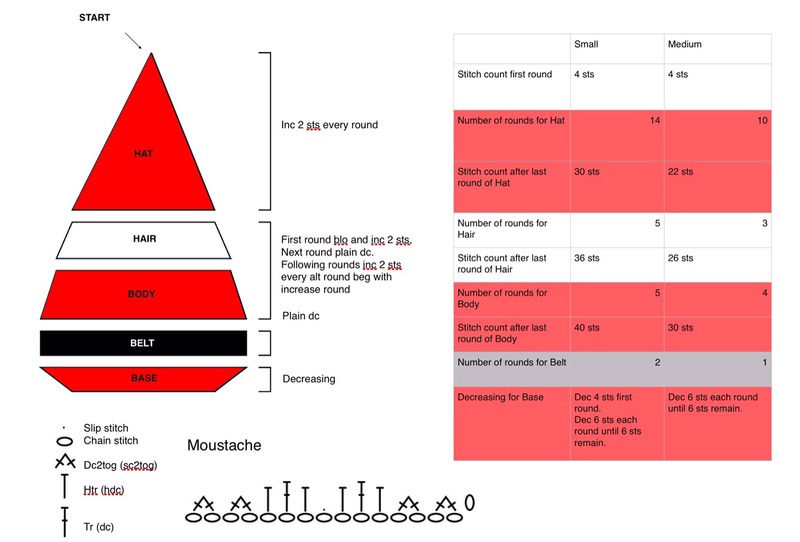 There is also a stitch diagram for the moustache, as this differs slightly from the one for the Large size. Use the same pattern for the moustache of the Middle and Small, but use a 2.5mm hook for the Small. Further instructions for the details are as follows (with a gentle reminder that I am using UK crochet terms): Hat Bobble Make a slightly smaller bobble for both these two, using only 3 rounds. Make the first round 6dc, the second 12dc, and the third 6dc. You might like to use a smaller hook for the Small sized one. Hat Brim Follow the same principle as for the Large Santa, by working a plain round of dc, followed by a round where you increase evenly around, and then another plain round of dc. For the Middle Santa increase by 6sts evenly on the increase round, and for the Small Santa increase by 5sts evenly. Beard and Face For the Middle Santa start with 10dc and follow the pattern as for the Large Santa. For the Small Santa start with 8dc. For the Face, follow the same principle as for the Large Santa, working 4 rows for the Middle, and 3 rows for the Small. 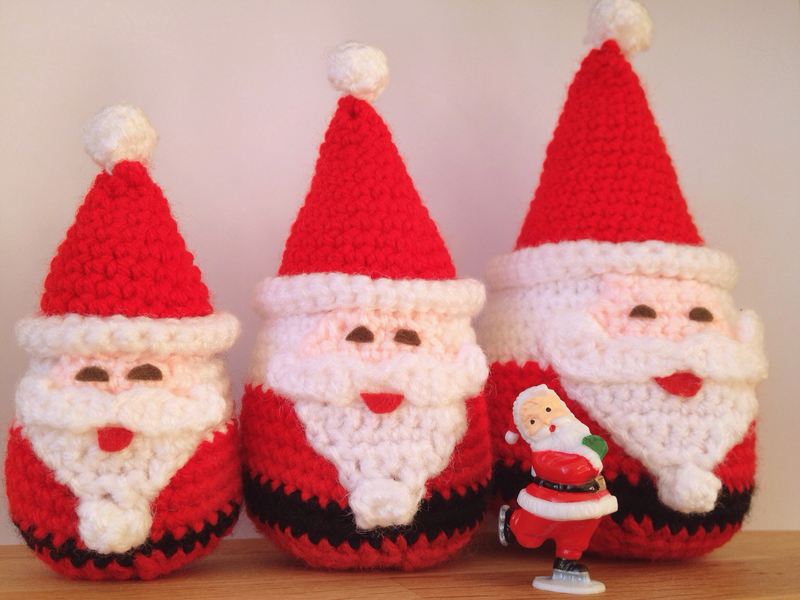 If you do have a go at multi-sized Santas I would love to see a photo. Meanwhile, I had better do something about Christmas! Real cute, I wish I found this early. Guess it will have to be made for next Christmas.